Oh the things we do for photos… stumbled off the highway, onto a road that looked like it had a path for cars, and found the mecca of all cactus farms. I labeled this post Cactus Snakes because while we were searching for the perfect cactus to take photos with, I almost died by getting bit from a rattlesnake. They were everywhere! We also stumbled onto, what seemed like, a drug lab. It was like Hotel San Cristóbal was offering it’s very own hotel package called the Narcos Special, which basically included your own living and breathing version of Breaking Bad Season 6 labeled, “Cactus Hunting with the Drug Lords”. Todos Santos is a very unassuming town. The town occupies land about an hour outside of Cabo; with the Sierra de la Laguna mountain range as it’s background, it’s a town filled with artists and surfers. I had this chic pilgrim dress made for me in Bangkok, while I was visiting over the holidays. It’s one-of-a-kind and one-of-a-kind made specifically for me. I wanted something with uber large sleeves that was made out of silk that was also easy to throw on and run around with. My tailors are magical genius’ there. For that reason, whenever I have a trip to Asia, I almost always stop in Bangkok for a few days to get suited up (dresses, pajamas, kimonos, and of course, suits). For some reason though, this dress reminded me of Mexico, so I only found it fitting to take it along with me on my very fabulous trip. I paired it back with this gorgeous wide-brim hat that I got in Mexico City a few years back. It's been a while since I've been on a holiday in Mexico, and I don't really understand why; It's definitely one of my favorite places worldwide. Coco wears: Silk custom made dress from Bangkok, Thailand, Mexican Hat from Mexico City, Maui Jim Aviator Sunglasses. Photographer: Emily Diane. Location: El Pescadero, Baja California Sur, Mexico. 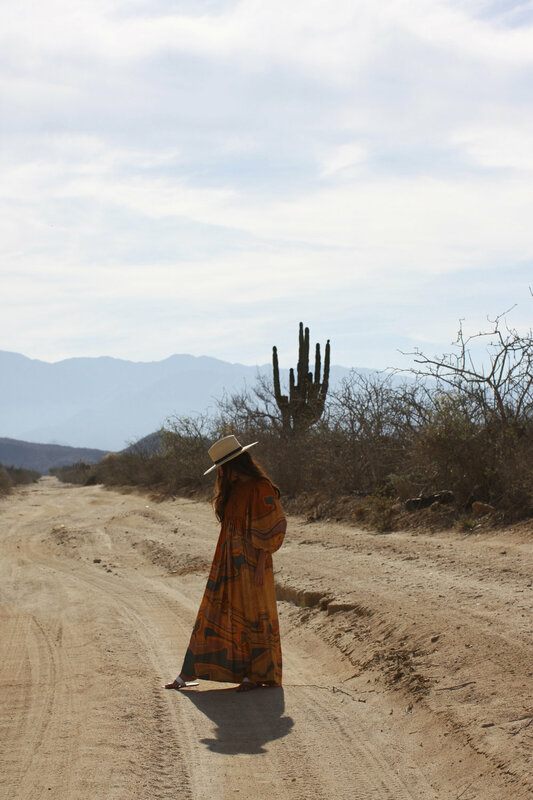 City Guide: Todos Santos. Playlist: Bonjour Tristesse.